America’s grandmother, Betty White, has coupled up with guitar god Slash to promote a new Los Angeles Zoo exhibit. Best celebrity couple ever? We think so. 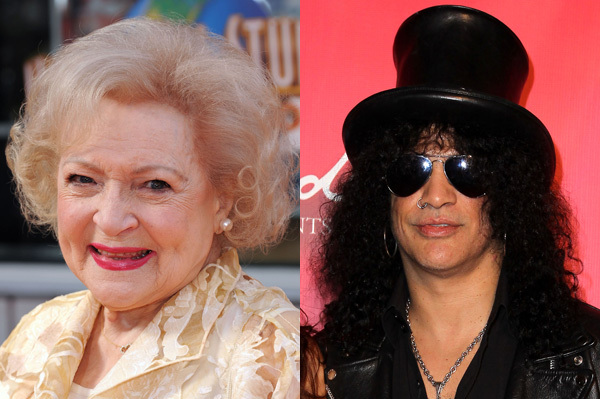 Former Guns N’ Roses star Slash and America’s grandmother, Betty White, are coupling up, but not for a sordid affair. The animal-loving duo has teamed up to promote a new exhibit at the Los Angeles Zoo. The commercial is part of a campaign to promote The LAIR, an exhibit featuring “weird, rare and endangered amphibians, invertebrates and reptiles,” opening on March 8. In the spot, White explains interesting frog trivia to an enthralled Slash. “You can tell which one is male or female by the dark pads on their fingers”, The Lorax actress comments. “Really? That’s cool,” he responds. The White/L.A. Zoo collaboration was a no-brainer for the park, according to Zoo President Connie Morgan. “Betty White is synonymous with the Los Angeles Zoo. Her heart and her advocacy for the animals that share our earth help drive us to excellence,” she said. The zoo even has a baby orangutan named in honor of her Hot in Cleveland character, Elka. White has a long history with animal rights. She’s been an animal lover since birth, adding that her parents fostered that love by bringing stray animals into the home. Slash has also been active in animal rights issues for years with a special interest in reptiles.